Vancouver, Canada – Mawson Resources Limited (“Mawson”) or (the “Company”) (TSX:MAW) (Frankfurt:MXR) (PINKSHEETS: MWSNF) announces drill results from a further four diamond drill holes from the 2016-17 winter program at the Company’s 100% owned Rompas-Rajapalot Project in Northern Finland. This winter a total of 16 diamond holes have been completed to date, with two in progress for 3,753m. Three rigs are now drilling around the clock and a fourth rig will be mobilized to site during mid-March. A new style of gold-bearing system has been discovered at South Rajapalot, characterised by an extensive area of potassic-iron-sulphide alteration located up to 1,800m south of the Palokas prospect. Drilling has defined a zone that extends for 900m along strike and 400m in width that remains open. To date, a total of 12 holes have been drilled into the area, with assay results available from 2 drill holes (PAL0033 and PAL0037). PAL0037 intersected what is believed to be, in part, the source of 68 grab samples from boulders and subcrops that lie immediately down ice direction which assayed >0.1 g/t gold and range from 0.11 g/t gold to 3,870 g/t gold with an average of 101.4 g/t gold and median of 0.6 g/t gold. Grab samples are selected samples and are not necessarily representative of the mineralization hosted on the property. Drill core from this new discovery will be on display at the PDAC convention in Toronto at Mawson’s booth #2941 from Sunday 5 March to Wednesday 8 March. Dr. Nick Cook, President, will be at the core display booth #3107B on Tuesday 7 and Wednesday 8 March. CEO Michael Hudson will discuss the drilling program and the new discovery at 10:20am on Monday 6 March in Room 802. 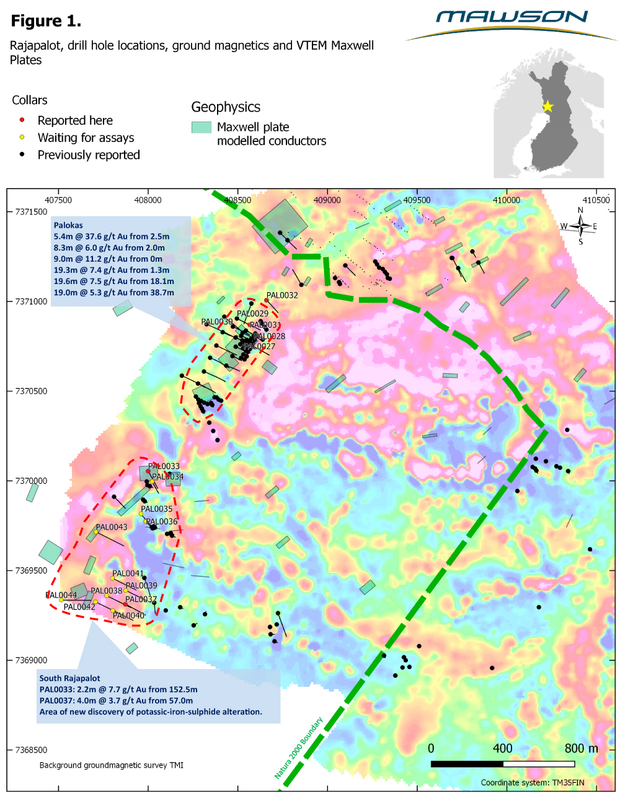 Gold-anomalous alteration has been drilled to date over a 900m x 400m area in South Rajapalot. It consists of sulphide, magnetite and biotite hydrothermal alteration hosted in predominately grey albitites. Textures range from veined albitic granofels through fractured to locally schistose. Veining and fracture fill includes magnetite, pyrrhotite and magnetite-pyrrhotite (+/- quartz). Local retrograde chlorite after biotite and vein-controlled chlorite and magnetite are also present. Preliminary hand-held XRF analysis confirms the presence of scheelite and molybdenite, the former visible under UV light as tiny veinlets and disseminations. The alteration style is best described as a hydrothermal potassic-iron-sulphidic type, is clearly post-metamorphic, and most likely driven by granitoid intrusions. Altered rocks below the mineralized package contain locally abundant talc and tourmaline. The iron-rich nature of the mineralized rocks is a common theme in either the oxide or sulphide form, with a variably sulphidic and chloritic overprint. Chlorite is regarded as the lowest temperature silicate mineral with gold, apparently controlled by quartz veins. Marginal to mineralization, talc and tourmaline rocks are present throughout. Two additional drill holes, PAL0031 (1.0m @ 1.5 g/t gold from 85.4m) and PAL0032 (no significant results) were drilled 50m and 270m respectively to the north of Palokas (Figure 1). These results are above higher grade results, and support the concept that the Palokas mineralized body is a plunging shoot as defined by earlier drill results that included 10.0m @ 11.6 g/t gold (Mawson Press Release Feb 21, 2017). The alteration system at Palokas is different to the new brittle and veined potassic-iron-sulphide alteration discovery at South Rajapalot. Mineralization at Palokas is hosted by a greater than 20m thick, magnesium- and iron-enriched, pyrrhotite-bearing isoclinally folded metasedimentary sequence that is sub-planar at the prospect scale. Although the host rocks are isoclinally folded and metamorphosed to amphibolite facies, the mineralization appears controlled by a series of late brittle structures, represented in drill core by quartz and quartz-pyrrhotite-tourmaline (+/- molybdenite, gold) veins. Retrograde alteration of the host package to chlorite is one of the dominant characters of the margins of quartz veins. Reaction of reduced gold-bearing hydrothermal fluids with iron-rich rocks is the most likely mechanism to precipitate the gold. A plan views of the drill results is shown in Figures 1. Tables 1 and 2 include all relevant collar and assay information. The true thickness of mineralized intervals is interpreted to be approximately 90% of the sampled thickness. Two diamond drill rigs (K1 & K2) from the Arctic Drilling Company OY (ADC) with water recirculation and drill cuttings collection systems were used for the drill program. Core diameter is NQ2 (50.6 mm) diameter core. Core recoveries were excellent and average close to 100% in fresh rock. After photographing and logging in Mawson’s Rovaniemi facilities, core intervals averaging 1m in length for mineralized samples and 2m for barren samples were cut in half at the Geological Survey of Finland (GTK) core facilities in Rovaniemi, Finland. The remaining half core is retained for verification and reference purposes. Analytical samples were transported by Mawson personnel or commercial transport from site to the CRS Minlab Oyfacility in Kempele, Finland. Samples were prepared at Kempele and analyzed for gold at Raahe using the PAL1000 technique which involves grinding the sample in steel pots with abrasive media in the presence of cyanide, followed by measuring the gold in solution with flame AAS equipment. The QA/QC program of Mawson consists of the systematic insertion of certified standards of known gold content, duplicate samples by quartering the core, and blanks the within interpreted mineralized rock. In addition, CRS inserts blanks and standards into the analytical process.